How do I collect Candies and win a level? To win, you need to collect Candies from the puzzle by matching them. You can see which colors, and how many of each Candy you need to collect, in the top-right corner box. Match 3 or more Candies of the same color to clear them from the puzzle and collect them. Any Candies above them will fall into the spaces where the matched ones were. How do I swap Candies? Tap your finger on the screen over the Candy you want to swap, and drag it to the Candy that you want to swap it with. A move is swapping one pair of Candies. You only have a limited number of moves to win each level. If you run out of moves before you collect all the Candies you need, you will have to try the level again! What are the numbers on the Candies in the puzzle? When you match Candies, bonuses are added to any neighboring Candies that you need to collect! You will see the number 2 on top of these Candies. If you match Candies with bonuses, you collect a higher amount of Candies. If more matches are made when new Candies fall onto the screen, bonuses can keep adding up! Bonuses on Candies can go up to 9! Bonuses disappear after one move. You should try to match Candies with the highest bonuses if you can. It takes 1 energy to play a level. If you win the level, you'll be rewarded with more energy. If you are replaying a level you have won before, then you'll need to win with 2 or more stars to be rewarded with 1 energy again. How do I unlock more regions? You'll need to have a minimum number of stars in order to access the next region. Earn as many stars as you can to unlock more regions and levels! Who is The Gummy Bear King? He's an evil tyrant of the Candy Empire. He's always trying to get in the way of adventurers and puzzle-solvers. Some levels on the map are marked by a Gummy Bear head. There you will have to battle the Gummy Bear King or one of his minions! How do I battle Gummy Bears? 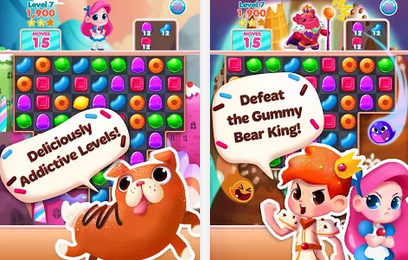 Match Candies of the colors shown in the upper-right box to lower the Gummy Bear's stamina bar. The bar is located under the Gummy Bear. The bigger the match, the quicker you will lower his stamina. Reduce it to 0% and you will win! Match Candies with big bonuses to win before you run out of moves. What else do Gummy Bears do? As you battle a Gummy Bear, you may see it glow with yellow energy. That means on the next move, the Gummy Bear will add an obstacle to your puzzle to get in your way. You can prevent this by stunning the Gummy Bear. To stun him, you need to make a big enough match with the right candies, to reduce its stamina by 10% or more in a single move. How do I make a special space? A special space is made when you match 4, 5, or more Candies. The special space appears in the spot where you swapped a candy to make a match. Each type of special space is made from a different combination. Sweet Spot - made by matching 4 in a row. Sugar Blast - made by matching 5 in a '+', 'T', or 'L' shape. Candy Scoop - made by matching 5 in a row. How do I activate a special space? Activate a special space by making a match on top of it! You can match any number of Candies, and they can be of any color. If you match 4 or more Candies, you will activate the first special space, and then make a new one in the same spot. While any color of Candy will activate a special space, select the Candies you use carefully. For the Sweet Spot and Candy Scoop, it can make a difference in what happens next. How does the Sweet Spot work? The Sweet Spot is a white space with a pulsing green plus symbol. How does the Sugar Blast work? The Sugar Blast is a white space with a pulsing red diamond. When activated, the Sugar Blast will clear every Candy in its row and column. If you need any of the Candies in the cleared row and column, they are collected for you. It does not matter what color you match on the Sugar Blast to activate it. How does the Candy Scoop work? The Candy Scoop is a swirling rainbow space. When activated, the Candy Scoop clears and collects ALL of the Candies of ONE color. The color you match on the Candy Scoop is the color that is cleared. Each Candy that you clear is worth 50 points, or 100 points if it is a color you to collect for that level. Each special obstacle you clear or collect is worth up to 300 points. Each match that is made by falling Candies after a move is worth even more! Any special spaces remaining in the puzzle activate, giving you bonus points. Additionally, if you complete a goal with moves left over, more special spaces will appear and activate, raising your score even higher! Boosts are items that you can purchase that will help you win levels and get higher scores. For the first few levels of the games, boosts are not available. You will unlock them as you progress through the levels. Where can I get boosts? Boosts can be purchased at the pre-game level screen (after selecting a level on the map) or at the bottom of the screen during a level. A few boosts recharge over time. If you run out, you can come back the next day and will have a boost for free! What are the effects of boosts? To find out the effect of each boost, tap on its icon for a description. If you run out of moves before winning a level, you'll have a chance to buy a few more moves to help you win. On the map screen, there is a + button that you can tap to add more Gems.